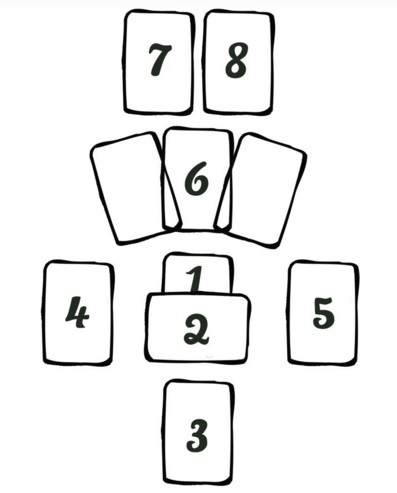 I know that some readers like to pull out a deckload of cards, but I believe this should only be done when a) the reader has experience and can genuinely, intuitively know what the cards mean; and/or b) the cards have assigned positions, i.e. each card answers one specific question. Now, I'm well aware that I represent one view and plenty of people disagree with me, but - again, subjectively - I'm yet to manage to make more than half a dozen cards work without assigned positions. Each card has multiple meanings and interpreting one card incorrectly can change the whole message. So, for me, the more cards there are in the spread and less structure (assigned positions) there is for the message itself, the seeds of chaos are sown: the message becomes a blur of unrelated, unconnected words my intuition struggles to piece together. I'm all for de-cluttering in life in general, so I find that 3-4 card cards can usually answer any question. For more information, ask a new or a follow up question. Of course, Celtic Cross and other longer spreads are absolutely and definitely fine and useful, because with assigned positions, each card has a certain question they answer and the spread as a whole tells the complete message. At some stage of practising tarot, this seems bound to happen. One specific card (or cards) start popping up, for almost every possible question or spread but due to the repetition, the message is not clear. In my experience, the stalker card keeps appearing as long as it takes to figure the message. It might be an important decision or a suppressed thought or emotion bubbling under. Or, an approaching turn of events. Remove the stalker card from the deck and ask the cards what's the message (i.e. "please explain in other words..."). Ask what area in life the stalker card relates to. Meditation or good old deep pondering. Try and not think the card itself, but scan through your life, thoughts and emotions to identify anything that's sticking out, needs addressing and/or might be an issue you've been trying to ignore. My own favourites are a general spread combined with meditation/deep thinking - not focusing on the stalker card as such, but on my inner world (where the card's message is coming anyway). Accurate timing with tarot is notoriously difficult and it's probably the easiest question to get wrong. Some readers have developed tried and tested methods that work for them, but there is no single sure-proof system that would work for everyone. I share the view that timing can't always be done, because the future is not set in stone and both our own actions and everyone else's actions affect it moment by moment. However, it seems that the stronger emotional impact an event will have, the more likely it is to show up in the cards in advance. For me personally the future events start showing up 1-3 months early depending on the mentioned emotional force attached to them (how strong positive or negative feelings the upcoming event or change will cause in the querent), but life-changing events - such as meeting my future husband - showed up a year early. I'm sure longer predictions can be made too but tracking and confirming them is, of course, slow. The most widely known methods for scoping for timing employ the Minor Arcana suits. Each suit governs a season (approximate starting dates based on the northern hemisphere): Cups = spring (March 20), Wands = summer (June 20), Swords = fall (September 21), Pentacles = winter (begins December 21). Alternatively, you can interpret the suits as time periods: Swords = days, Wands = weeks, Cups = months, and Pentacles = years. The numbers of cards give the week of the season in the first option; and the number of days, weeks etc. in the second option. 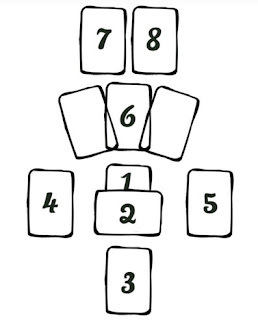 However, as each reader has a personal relationship with their deck, everyone more or less hones their own system. I mostly rely on intuitive interpretation based on the card illustration and the overall message of the spread. Frustratingly, timing often depends on your own or someone else's actions, so asking for "when will I meet Mr/Miss Right" might give you an answer: "when you free yourself from your emotional baggage, adopt a more positive outlook in life and get active!". 1 - you at this moment. 2 - crossing card; something you're carrying now. 3 - basis that brought you here. 4 - something leaving your life. 5 - something entering your life. 6 (3 cards) - resources available to you. 7 - word of advice. 8 - purpose or direction where to head. 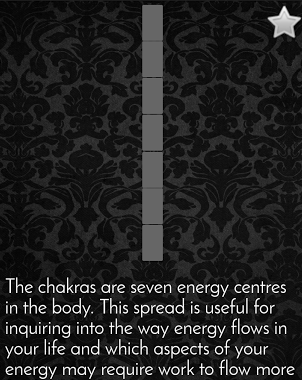 Chakras, according to the Indian tradition, are seven energy centres located in the body. 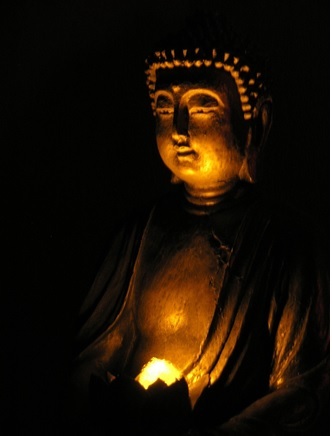 When the chakras are "open", the life energy flows freely through mind, body and soul and the person is in balance. When one ore more chakras are "blocked", life feels unfulfilled, inauthentic or even suppressed in particular in the area where the chakra is blocked. Are your chakras in balance? Check from here too. From bottom to top: 1 - root chakra: this card represents your sense of survival and basic needs. 2 - sacral chakra: this card shows your centre of creativity, enjoyment and pleasure. 3 - navel chakra: this card is about self-esteem, the key to feel more powerful in life. 4 - heart chakra: what's the status of your balance and love in all forms, including self-love. 5 -throat chakra: how is your self-expression, how well you can speak your truth. 6 - third eye: the status of your intuition. 7 - crown chakra - your connection with the divine, spiritual guidance. Photo by G Schouten de Jel, via FreeImages.